Merging is probably the hardest part of freeway driving for new drivers. 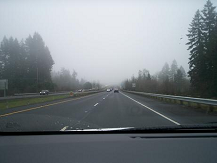 Once you have successfully entered with traffic, freeway driving is relatively easy. Since there are no intersections, stop lights, or pedestrians on the freeway, there is less chance of collisions. However, though there are fewer collisions on freeways,the collisions that do happen cause more vehicle and bodily damage because of higher speeds. Before a new driver attempts freeway driving, I suggest, and practice with students on major through streets that have speeds between 35-55 mph. Back roads and country roads are great for this and they usually have less traffic to contend with. But any street that allows you to practice near freeway speed will do. Once you are comfortable with higher speeds, you are ready to start freeway driving. 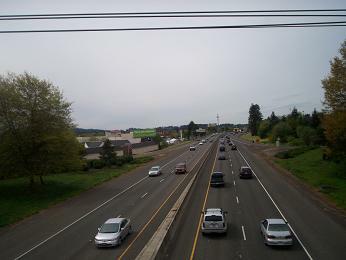 Above is a picture of an entrance ramp with a curve. Normally you take the curves entering or exiting a freeway not much more than 25 mph . Once you start coming out of the curve, start getting your speed up to the speed of the traffic on the freeway. *When highways were first built in the U.S. they were straight roads with rarely any curves. 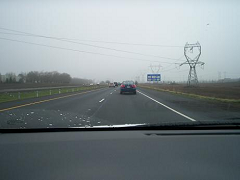 It was found that drivers would get "highway hypnosis", causing less attention from drowsiness, and more collisions. Today they purposely make curves in highways to keep drivers alert. Remember the speed of traffic may NOT be at the speed limit. During rush hour, traffic often isn't going over 30 mph. Since those already on the freeway have the right of way, it is important to make sure your speed matches theirs before you merge. Do remember traffic could be at a stand still on the freeway in a traffic jam. Once you are in the travel lane, check your rear view mirror to see if you need to speed up for a vehicle behind. For drivers already on the freeway, although you have the right of way, it makes for safer, easier driving for everyone to help out those merging when you can. By either adjusting your speed or making a lane change to the left. Keep three to five seconds with the car ahead of you on the freeway. 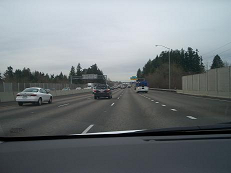 Once you have successfully merged with traffic on the freeway, it is important to keep plenty of space between you and other cars around you. Remember at higher speeds you need more stopping distance and reaction time. Below are pictures showing the distance between vehicles on the freeway. For safety you should maintain at least a three second distance with the vehicle ahead of you while traveling freeway speed. There are several ways to know the seconds you have between a vehicle while freeway driving. Generally you will see space for about one more car than you have seconds behind a vehicle, while traveling 55mph. You could choose to watch the lane divider lines. If you see 3-4 white divider lines between you and the vehicle ahead, you are 1-2 seconds behind that vehicle. 4-6 divider lines is 2-3 seconds following distance, and 6-8 lines is 3-4 seconds. You can also just count the seconds from a stationary point with the vehicle ahead. 3 seconds may seem like a lot of distance and it is about 240 feet at 55 mph (a short block) but if the vehicle ahead had to suddenly brake, you would need that much distance to safely brake or stop. Maintain one to two car lengths with the vehicles beside you. This rule applies for any road with multiple lanes in each direction. The picture below is a good illustration of the space you should keep beside you at all times. All three vehicles below have plenty of space to swerve into the adjacent lanes if they had to. For several reasons keeping this space is important. A driver next to you could choose to make a lane change without checking beside him and not see you in his peripheral vision. (you could do the same). You would also want space to swerve and escape a vehicle or other hazard coming at you from the opposite direction. Also what if the vehicle next to you for some reason lost control and skidded into your lane? If he was ahead of you or behind you, he would not hit your vehicle, but being right beside you would cause him to collide with your vehicle. Be looking 20-30 seconds ahead while driving freeway speed. Twenty to thirty seconds ahead is about 1/2 mile at 55 mph. In the picture above that would be looking beyond the last tree on the right. With curves and hills on a freeway you may not be able to always see that far ahead, then be looking as far ahead as you can see for traffic jams or any other roadway hazard. Another thing to notice in the picture above is how the last four cars on the right side of the freeway are so close to each other. The last car on the right is at the back end of the car in the left lane next to him. That would be coming in the drivers blind spot, especially if his side mirrors are not adjusted correctly. the second car on the left is almost in the right car drivers blind spot. Many of my students like changing lanes on the freeway better than on city streets off the freeway because although it's at a higher speed, there are less distractions such as no intersections, pedestrians or parked vehicles to watch for. There is also normally a more constant speed on the freeway. Changing lanes is easier when vehicles are driving at a constant speed, even if faster, rather than stop and go traffic in the city. Wait for the dashed white lines to make a lane change or merge on the freeway. In the picture above on the right the vehicle is making a lane change giving me less than two seconds behind him. If he had to suddenly brake, this could risk me hitting him from behind for not enough space. In the picture on the left the driver is giving me at least two seconds of space, however notice the solid white lines. This driver is doing a lane change coming out of a tunnel where a sign is posted saying no lane changes are allowed. Keep your foot on the gas pedal and with the flow of traffic on freeway lane changes. Since traffic is going much faster on the freeway it is important to keep your speed up while changing lanes on the freeway. Many of my students let their foot off the gas as soon as I ask them to make a lane change while freeway driving. Unless the traffic is starting to suddenly slow, letting your foot off the gas pedal will cause the vehicle behind in the lane you are coming into to come to close to you and possibly cause the driver to hit you. Watch for motorcycles in the lane you are coming into while freeway driving. Remember motorcycles are smaller and harder to see. Keep in mind they could be in your blind spot on lane changes.